PRODUCT: ZURN ZN158-C Series, 10 in. 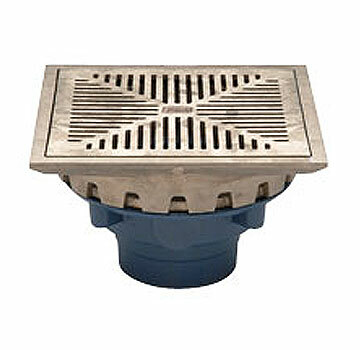 Square, Flat Promenade Deck Drain Kit. Dura-coated Cast Iron, Rotating Frame, Heel-proof Grate, Underdeck clamp, Frame Clamps, ZN polished Nickel-Bronze grate. Price/Each. * Specify OUTLET before adding to cart. * Special Order: shipping leadtime 1-3 business days. 12" Square Dura-Coated cast iron body. 10" Square Polished Nickel-Bronze Top Grate. ZURN Z158 10 in. Square, flat promenade deck drain kit. Dura-coated cast iron, rotating square promenade frame, heel-proof grate, underdeck clamp, frame clamps, 2-3/4 body height, 3 inch Threaded Inside Pipe (IP) outlet. Price/Each.